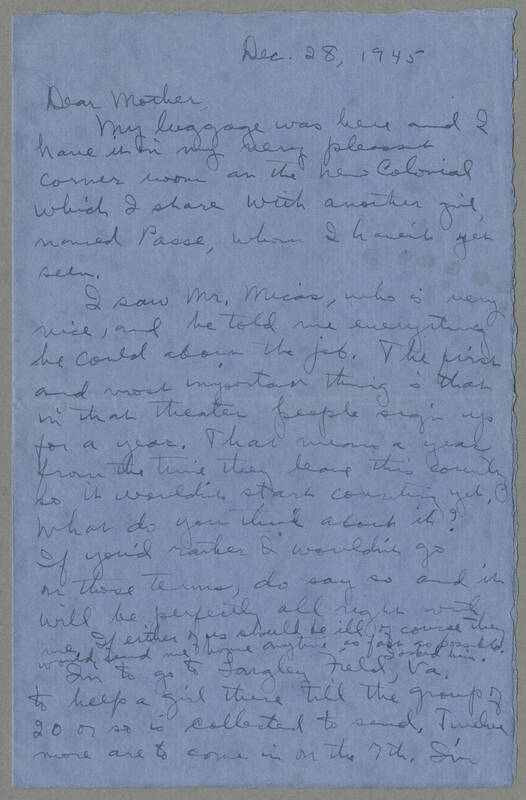 Dec. 28, 1945 Dear Mother, My luggage was here and I have it in my very pleasant corner room at the new Colonial which I share with another girl named Passe, whom I haven't yet seen. I saw Mr. Micas, who is very nice, and he told me everything he could about the job. The first and most important thing is that in that theater people sign up for a year. That means a year from the time they leave this country so it wouldn't start counting yet. O what do you think about it? If you'd rather I wouldn't go on those terms, do say so and it will be perfectly all right with If either of us should be ill of course they would send me home anytime, so fast as possible. I asked him. I'm to go to Langley Field, Va. to help a girl there till the group of 20 or so is collected to send. Twelve more are to come in on the 7th. I've.